Monday's summit between President Obama and Israeli Prime Minister Benjamin Netanyahu largely ignored the foundering Middle East peace process. Palestinian leaders are refusing to revive formal negotiations as long as Israel continues building settlements in the occupied West Bank. Much of the international community considers the settlements illegal, but those settlements have some fervent supporters from the U.S., evangelical Christians. 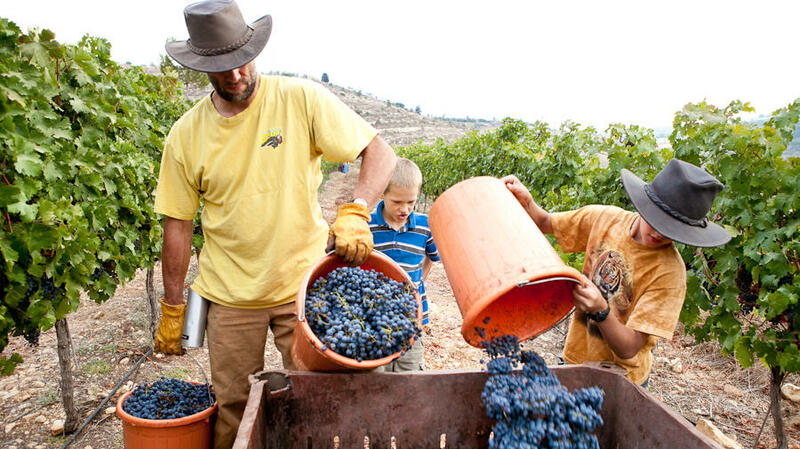 NPR's Lourdes Garcia-Navarro visited one settlement where evangelicals are helping Israeli Jews tend their vineyards. LOURDES GARCIA-NAVARRO, BYLINE: It's wet and windy day in Shilo, a Jewish settlement in the central part of the West Bank where about 10,000 Jews now live. The Christian volunteers stomp in with their heavy mud splattered boots and North Face raingear. It's been a tough morning pruning the vines, a winter storm has been beating down on the hills. TOMMY WALLER: We don't bring people here that are expecting mud baths and skin treatments and things like that. You know, we're kind of rough guys, nice guys; a lot of us are, you know, rednecks from the South wanting to do a good thing and to help people. GARCIA-NAVARRO: That's 50-year-old Tommy Waller from Franklin, Tennessee. He's a big guy with a big smile and a long prophet's beard. Waller founded Ha Yovel, a non-profit group that brings Christians to what his website says is quote, "the mountains of Israel, where prophesy meets reality." Of course, the problem is that the world doesn't recognize where we're standing as Israel. Most of the international community views the Jewish settlements in the West Bank as illegal. The volunteers who pay for their tickets and their expenses to come here mostly work in the many wineries in the settlements for about six weeks at a time. Hundreds take part every year. It's a kind of a work-state program with a spiritual purpose. WALLER: We take the bible and we look at those things and we see that one of the exciting things for us is that the prophecies of Scripture are being fulfilled. GARCIA-NAVARRO: Many evangelical Christians believe that the end of days and the coming of the messiah will center around Israel. And they interpret the foundation of the Jewish state as biblical prophecy becoming reality. It's a hugely emotional issue for the Christians who come here. They believe it is their duty to help Jews expand their control over Judea and Samaria, the biblical term for what is now the occupied West Bank. Mike Clayton is a former preacher from Seminole, Oklahoma, who's working on the vineyards through the Ha Yovel program. MIKE CLAYTON: Isaiah 61:5: The son of the foreigner will come and tend your vines. A few days ago, myself and my son got off a plane and I got to watch as I handed my son - sorry. I handed my son a pair of pruners and he fulfilled Scripture. Is the bible true? Is all this happening? I saw it with my own eyes. GARCIA-NAVARRO: For the settlers, though, the presence of the Christian workers has more practical applications. GARCIA-NAVARRO: Veret Ben Sadon helps run the Tura Winery. SADON: Today we have more than 200 acres. It's a lot of agriculture. It take a lot of work and we saw that we cannot work alone. And I can say for sure that without his help, we cannot do what we are doing today. SADON: We believe that a lot of them are our enemies and we don't want to give them work. We prefer to give work to our friends and our neighbors, and that's what we are doing. GARCIA-NAVARRO: The Palestinian Authority does discourage Palestinians from working in the settlements, though many of them do. Christian volunteers also give the settlers a political advantage in what has become a key battleground in the settlement issue: the United States. GARCIA-NAVARRO: Back in the meeting hall, Yisrael Medad jokes around with his Christian guests. He's a spokesman for the Shilo settlement and he gives them an unambiguous message. MEDAD: I would hope that each one of you could write a personal letter to any or all of your elected officials. GARCIA-NAVARRO: Over the years, that call to activism has paid off, with many Christian groups in the U.S. providing not only political but financial support for the settlements in the West Bank. When members of the Ha Yovel group aren't here, they're on the road in the U.S. speaking at churches and community centers. Medad says it's vital support. GARCIA-NAVARRO: Lourdes Garcia-Navarro NPR News. Transcript provided by NPR, Copyright NPR.